Paris is the capital city of France, also the largest and most populated city throughout France. Paris is located in Northern France on the River Seine. Paris has a estimated population of over 2, 205,000 inhabitants. This stunning live Paris webcam shows a number of live cam Paris views overlooking famous and popular Paris landmarks that make the city of Paris one of Europe’s leading tourist destinations. Paris is really well worth a visit in the real-world. However this Paris streaming video camera will give you a real-time video view of many of France’s capital city well known landmarks in Paris to wet your appetite for a future visit to Paris in France. 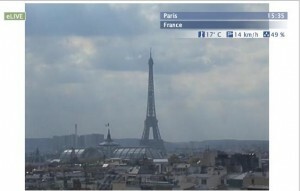 Enjoy live streaming webcam views overlooking the iconic Eiffel Tower in the heart of Paris. Check out the Paris web cam views also overlooking the Opera Garnier, the historic Notre-Dame, the well known Pantheon, La Madeleine. Enjoy live webcam views in Paris overlooking the Arc de Triomphe, the St Augustine Church and the Sacre-Coeur Basilica. Enjoy your live virtual web cam tour to Paris via this live streaming video camera in the heart of Paris in North France.